This review was meant to be published on Well-Read Child first but due to some mix-up, didn’t get posted. Summary: Follow along through all four seasons to find out what the Bennett family does on their farm. This is a very colourful non-fiction book for children to help city kids see what it’s like on a farm. 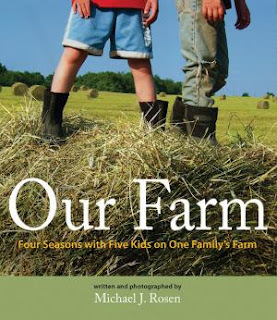 The book follows one year in the life of one family in a small Ohio farm. It’s told by the five children and their parents and is accompanied by beautiful photographs by Michael J. Rosen. What sorts of things do we see and read about? Baling hay, tending cattle, raising chickens, snow sleding, hunting, grapevine swinging, putting in a pond, picking mushrooms, breeding cows, school for farm kids and much more. Each new topic has a title, a short intro and then words straight from the mouths of the Bennett’s about the topic. Sometimes it’s the parents who talk, sometimes the older kids and sometimes the youngest. It’s a great way for children who live in the city to get a good glimpse of what life is really like on a farm, without having to find one to visit. Plus if you visit a farm, you only see what life is like in that season, where as this book shows you a whole year. I really enjoyed the book and I think that children would enjoy it too.